Gov. 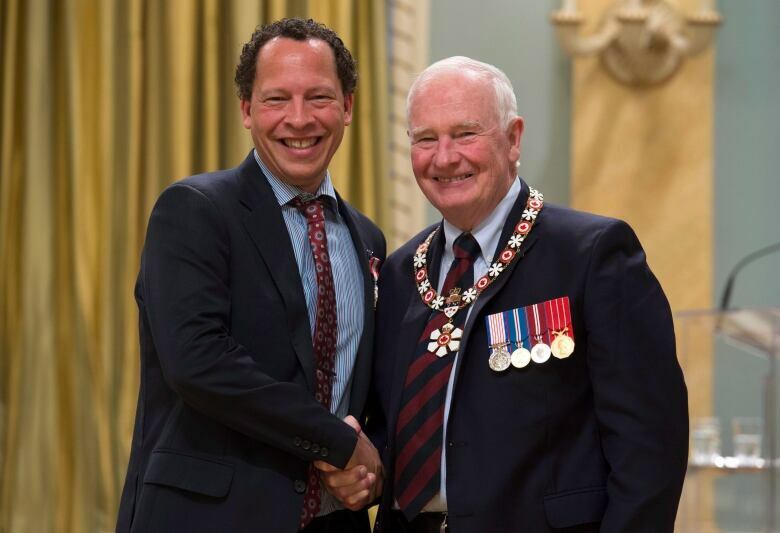 Gen. David Johnston presided over a ceremony investing 46 recipients of the Order of Canada, including hockey broadcaster Bob Cole, author Lawrence Hill, Indigo and Kobo founder Heather Reisman, former privacy commissioner Jennifer Stoddart and geneticist Brenda Andrews. Gov. 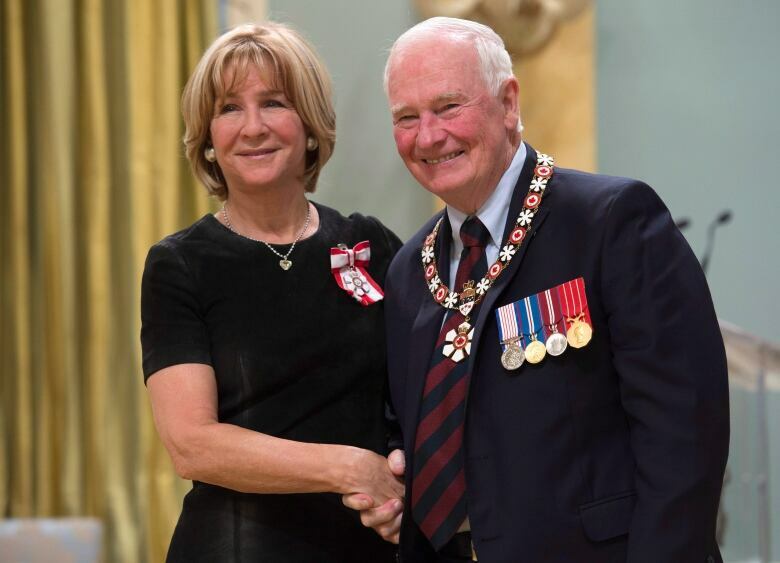 Gen. David Johnston presided over an Order of Canada investiture ceremony at Rideau Hall today as 46 distinguished Canadians joined or were promoted up the ranks. The honorees include Hockey Night in Canada broadcaster Bob Cole, author Lawrence Hill, Indigo Books and Kobo founder Heather Reisman, women's hockey pioneer Fran Rider, former Canada privacy commissioner Jennifer Stoddart, geneticist Brenda Andrews and actor Don McKellar. Friday's ceremony included one companion, nine officers and 36 members — the three tiers of the order. 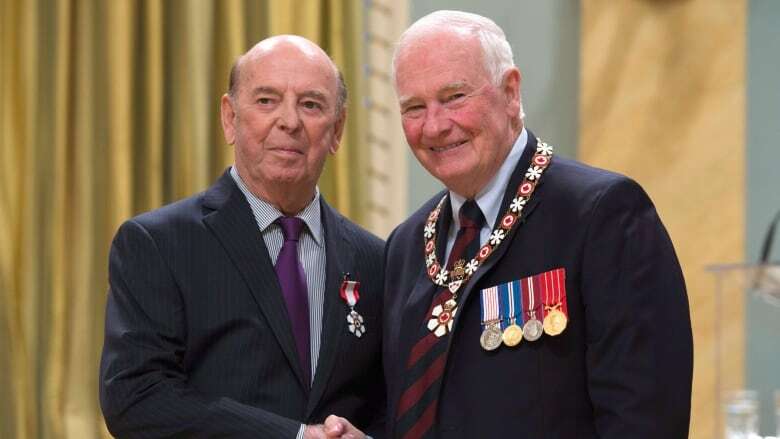 The Order of Canada was created in 1967, during Canada's centennial year, to recognize outstanding achievement, dedication to the community and service to the nation. Since its creation, more than 6,000 people have been invested. Andrews has moved Canada to the forefront of large-scale genetic studies. As chair of molecular genetics at the University of Toronto, director of a cellular and biomolecular research centre, and director of the Genetics Network program at the Canadian Institute for Advanced Research, she has nurtured and elevated many top genetics consortiums. Her research has illuminated how diseases are influenced by interactions among entire networks of genes. The innovative techniques she has developed for analyzing these interactions have been adopted by scientists around the world and are helping researchers respond to complex hereditary diseases. Ghoussoub has made major contributions in advancing Canada's stature in the mathematical sciences. An expert in partial differential equations and a distinguished professor at the University of British Columbia, he was the driving force behind the creation of three cornerstone institutions for Canada's mathematical sciences community. Namely, he led the establishment of the Pacific Institute for Mathematical Sciences, the Banff International Research Station and the Mitacs network. His leadership has enabled greater collaboration between academic scientific research and industry, and created internationally renowned hubs for mathematical enquiry and learning. Latraverse is a legend in the recording and entertainment industry. The first live-event producer in Quebec, he propelled a burgeoning industry toward uncharted horizons and was the first to produce outdoor mega-shows, such as those held on the Plains of Abraham and Mount Royal. As a manager and producer, he had a hand in furthering the careers of a virtual who's who of Québécois and international artists. He also founded major events and organizations, including Les FrancoFolies de Montréal and l'ADISQ. Moreover, for over 30 years, he has been committed to destigmatizing mental illness. Levitt has provided outstanding leadership in Canada's legal, business and cultural spheres. Chair of the board of directors of the Toronto-Dominion Bank and vice-chair of Osler Hoskin & Harcourt LLP, he is one of Canada's leading corporate governance advisors and a legal expert in mergers and acquisitions. Highly regarded for his sound counsel, he is a sought-out corporate director, and has strengthened many major corporations, organizations and educational institutions. He is a patron of the arts and a volunteer, and has played a pivotal role within the Montreal Museum of Fine Arts, notably as the chair of its board of trustees. One of Canada's great entrepreneurs, he has used his wealth to give back to others. He grew a Montreal classified advertising company into a leading global enterprise; from the proceeds of its sale, he created a family foundation. Through it, his unprecedented donations have guaranteed, in perpetuity, the Rhodes Scholarship in Canada, helped create a European organization dedicated to preventing climate change, and funded humanitarian projects in Africa. Committed to public service, he also serves as the current chair of the Trudeau Foundation and is a trustee of the Mandela Rhodes Foundation. McLaren is a legend in sports arbitration. A lawyer and professor of law at Western University in London, Ont., he is sought out by amateur and professional sports associations in Canada and abroad to resolve such issues as contract negotiations, athlete-coach disputes, and doping and corruption allegations. He co-founded the Sports Dispute Resolution Centre for Canada and has served for 25 years on the internationally renowned Court of Arbitration for Sport. Recently, he helped investigate allegations of systemic wrongdoing in the international track and field federation for the World Anti-Doping Agency. Both a renowned novelist and established literary translator, Poliquin is one of the few bicultural and bilingual writers of our country. With a scholarly and vivid style, he has published several works that explore matters of identity and otherness, including La Kermesse. Through his novels, considered emblematic of the Franco-Canadian minority experience, and his translations, which have garnered prestigious awards, he is helping to strengthen ties between the two solitudes and to bring the Canadian experience to international readers. Rutka represents Canadian neurosurgery on the world stage. He is the chair of the department of surgery at the University of Toronto and an expert in the treatment of brain tumours and intractable epilepsy in children. He co-established and directs the Arthur and Sonia Labatt Brain Tumour Research Centre, which has emerged as one of the world's key research centres on the molecular biology of brain tumors. He is also a former president of several prestigious organizations including the American Association of Neurological Surgeons and the World Academy of Neurological Surgeons. Shepherd is a global leader in the development of effective therapy for the most dangerous forms of lung cancer. At a time when the outlook for patients with lung cancer was extremely grim, she launched a bold research program through the National Cancer Institute of Canada, the Princess Margaret Cancer Centre and the University of Toronto, which has yielded significant results. She has led pivotal clinical studies that identified medications and treatment protocols that have now become the standard of care for the disease globally. She continues to be a key leader of prominent oncology associations in North America and Europe. Stoddart has ardently defended the privacy rights integral to a free and democratic society. Trained as a lawyer and a historian, she was a prominent figure in the field of human rights and employment equity before her appointment as Canada's sixth privacy commissioner. During her tenure she revitalized the Commission by leading initiatives that demonstrated how the protection of privacy was still possible, even in the information age. Notably, she recognized that the global reach of social media necessitated a coordinated response and reaffirmed Canada's leadership by rallying the international community to defend privacy rights, setting an example that many others have followed. Baird has championed the construction of buildings and urban spaces that create opportunities for human interaction and expression. Professor emeritus and former dean of the University of Toronto's Faculty of Architecture, Landscape and Design, he has made contributions to the theory of architecture and urban planning that have been recognized internationally. He put his ideas into practice through the drafting of zoning guidelines and neighbourhood design plans that have changed the fabric of Toronto and Vancouver's downtown cores. At his own firm, he has mentored a generation of Canada's most renowned architects and designed landmark projects carefully chosen for their public significance. An engineer, Bakht has advanced bridge safety and design in Canada. As the principal research engineer for the Ontario Ministry of Transportation, he used innovative methods to test and evaluate bridges across the province, resulting in longer-lasting structures. He was also a key figure in the development of updated highway bridge design codes for Ontario and Canada. In addition, he has made Pakistani and Indian literature more widely available to Canadians as a celebrated scholar, poet and translator of the Urdu language. Bélanger is a visionary industrialist who cares deeply about the development of his region. He built a world-class company based on sphagnum peat moss production and made Premier Tech both the leading Canadian producer in the field and the largest employer in eastern Quebec. He also set up a private research centre that has developed advanced technologies, including a bio-filtration system that uses sphagnum peat moss. His commitment to the region is evident in his generous support for various organizations, notably in the health and education fields. Bradshaw is one of British Columbia's most generous philanthropists and community leaders. The former president of Phillips, Hager & North, he played an important role in building the organization into one of Canada's pre-eminent investment management firms. After being diagnosed with prostate cancer, he went public with his experience to raise awareness of the disease and funds for medical research. An avid fisherman and former chair of the Vancouver Aquarium, he also supports coastal studies and fisheries research, particularly in salmon conservation. Brandon is Canada's leading authority on war art. As a historian and curator with the Canadian War Museum, she created exhibits and authored publications that have been instrumental in transforming our perception of war and art, and in helping us to better understand our history. Notably, her Canvas of War exhibit toured to rave reviews nationally and offered a compelling perspective of the realities of combat to a new generation. She has also championed women artists, both historical and contemporary, by showcasing their paintings to a broader audience. Brinton played a key role in building Canada's broadcasting industry, particularly in western Canada. He began his career as a radio and TV newscaster and host; later, as an executive with CanWest Global Communications, he established new television stations in underserved markets in Winnipeg, Saskatoon, Regina, Edmonton and Vancouver. He is a renowned champion of local programming and Canadian productions, jobs and talent. He has advanced the sector through his leadership of industry associations, and by involving his stations in projects that meet specific community needs. Brochu is an outstanding manager with exceptional human qualities. At the helm of Gaz Métro, one of the largest natural gas distributors in Canada, she has steered the company toward diversification and innovation while incorporating her passion for sustainable development and community involvement. Her renown has also led her to sit on the boards of a number of major Canadian companies. Committed to various causes, including student retention and women's homelessness, she also encourages young women to integrate ambition into their lives. Documentary filmmaker Buttignol is a transformative leader in our cultural industry. Creator of TVO's The View From Here and founding chair of the Documentary Organization of Canada, he has helped revitalize the genre both nationally and internationally. Notably, he has spearheaded workshops, panels and forums around the world to foster the growth of the industry. More recently, as president and CEO of British Columbia's Knowledge Network, he has given public educational broadcasting a new relevance and vibrancy in the province. Campbell is an advocate for sustainable, high-quality public institutions in Canada. As president and vice-chancellor of Mount Allison University, he has promoted and sustained the "Mount A" model of a personalized, immersive and interdisciplinary education that transforms students into engaged citizens and leaders. An international expert on postal systems governance, he has researched and written on adapting public postal operations to a sustainable position in a globally competitive and technologically challenging marketplace. Bob Cole is a legend in Canadian hockey broadcasting. As the lead play-by-play announcer on Hockey Night in Canada for almost 30 years, he made viewers feel as though they were in the stands, at the game. He continues to engage new generations of hockey fans with his passion for the game and his rich voice, which crescendos up and down with every play. He also provided commentary for various summer and winter Olympic events over a 45-year period, and has supported an array of charitable initiatives in Newfoundland and Labrador. A filmmaker, photographer, scholar, explorer and author of critical acclaim, Davis has made important contributions to our understanding of Indigenous peoples and their relationship with the natural world. Trained as an anthropologist and ethnobotanist, he spent much of his early career as a plant explorer searching for new medicines. Later, as explorer-in-residence at the National Geographic Society, he became a leading voice celebrating the wonder of culture and the rights of Indigenous peoples worldwide, through his distinct ability to convey complex information in a straightforward and inspirational manner. Now a professor at the University of British Columbia, he remains committed to conservation as the B.C. Leadership Chair in Cultures and Ecosystems at Risk. De Wilde has made transformative contributions to Canada's media sector. A former executive with Astral Media, she oversaw the turnaround of pay TV and the introduction of pay-per-view that has broadened choice for Canadian consumers. More recently, as head of TVO, she has transformed the television station into a trusted learning organization that engages and informs Ontarians both on-air and online. An advocate for arts and culture, she was recently appointed chair of the Toronto International Film Festival. Dobbin's philanthropy is advancing health care and medical research in Newfoundland and Labrador. Moved by a friend's plea for help, she became involved with the local autism society and, through her efforts, a state-of-the-art facility was built that focuses on diagnosis, treatment, education and research. In addition, thanks to her generosity, Memorial University has a new research centre dedicated to genetic disorders, and its students have greater access to bursaries and scholarships. Dufresne is an icon on the francophone music scene. One of the greatest voices in Quebec, she is the first female vocalist to perform rock songs in French. She turned Quebec show business on its ear with her keen sense of showmanship and eccentric costumes, and has given legendary concerts, including Magie Rose in Montreal's Olympic Stadium. She continues to perform while moving audiences with her talent as a painter, exhibiting her work in Canada and abroad. Fountain has had a transformative impact on Nova Scotia's cultural milieu. As a patron of the arts, she has supported initiatives that provide Maritimers with improved access to world-class performances in dance, music and theatre. Symphony Nova Scotia, Halifax Dance, the Nova Scotia College of Art and Design University and the National Ballet of Canada have all benefited from her personal support and involvement. Her philanthropy has also touched the broader community through the Halifax Foundation and the Community Foundation of Nova Scotia. Gertler is Canada's foremost expert in economic and urban geography. As a professor and endowed chair at the University of Toronto, he has transformed his discipline's understanding of innovation and regional development in urban areas. His studies have helped city planners adopt strategies to foster economic growth and knowledge creation. Also committed to strengthening teaching and learning, he has held successive administrative positions as dean of the faculties of arts and science, and now as president of the university. Gillespie has helped to ensure food safety for Canadians. An entomologist with Agriculture and Agri-Food Canada and an adjunct professor at Simon Fraser University, he conducted pioneering research on the ecological interactions between predators and prey and their agricultural hosts. He applied his research findings to the farming industry and developed pesticide-free management strategies that have been widely adopted by commercial greenhouse operations in Canada and abroad. As a result, he has been instrumental in significantly reducing pesticide use on our greenhouse vegetable crops and in increasing our understanding of the use of natural enemies for biological control. Goodman has made significant contributions as a generous philanthropist. After a successful career in Canada's investment industry, notably as co-founder of Beutel Goodman and founder of Dundee Corporation, he is now committed to giving back to his community. He is a former chancellor of Brock University, and his generosity has led to the foundation of schools in business and mining at several other post-secondary institutions. He has also supported a wide variety of other charitable organizations, such as the Royal Ontario Museum Foundation and Mount Sinai Hospital. Grisé has helped to affirm the French fact, to promote the arts and to advance research in Canada. A professor at the University of Ottawa, she developed a program for teaching Franco-Ontarian literature and oversaw the development of the first cultural policy for Ontario Francophones. She also promoted the arts and art accessibility as chair of the Ontario Arts Council. At Simon Fraser University, she served as director of the Office of Francophone and Francophile Affairs, giving greater access to post-secondary studies in French in British Columbia. 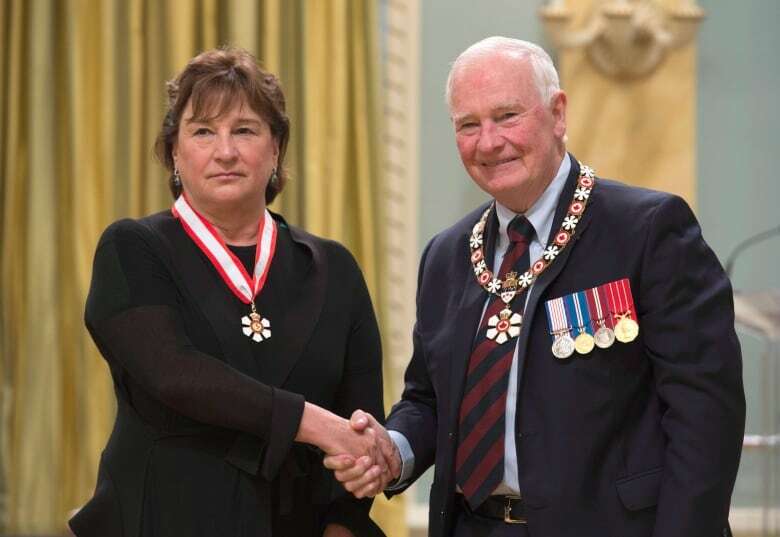 An engaged academic, she was elected president of the Royal Society of Canada. For over 30 years, Heyn and Thomson have nurtured the development of many of Canada's best contemporary dancers, choreographers and artistic directors. Co-directors of the School of Contemporary Dancers and creators of its professional program, they are highly regarded for establishing a training ground that is recognized for its technical and artistic excellence. Moreover, they established a concurrent degree program with the University of Winnipeg that has broadened career options for dancers and that has since been used as a model by others. As an author and social activist, Hill has helped us better understand the Black experience in Canada. His books Blood: The Stuff of Life, Any Known Blood and The Book of Negroes have captivated readers around the world and encouraged discussions about race, identity and belonging from historical and contemporary perspectives. An outspoken advocate of freedom of expression and racial equality, he has also been engaged with such organizations as Crossroads International, Book Club for Inmates and the Black Loyalist Heritage Society. Lemieux is one of our great opera singers. Blessed with an exceptional voice, she won the top prize awarded at the Jeunesses Musicales Canada National Competition not long after completing her studies at the Conservatoire de musique de Québec. She now ranks among the best contraltos in the world. Performing in recitals, operas and concerts, she has been acclaimed in some of the world's most prestigious opera houses, notably for her performance of Mrs. Quickly in Verdi'sFalstaff. She shares her inspiring passion through her warm and cheerful personality, and is the official ambassador for the Domaine Forget de Charlevoix International Festival. One of our great business leaders, Lessard is a role model in the food industry. He first made his mark at Provigo and, since then, has come to be known as a visionary and unifying manager. He later took over as head of Metro-Richelieu, which was in a precarious financial situation at the time, and transformed it into a leading retailer in Quebec. One of the most sought-after administrators, he continues to be involved in the community, volunteering with several organizations, including Centraide, the Montreal Museum of Fine Arts and Université Laval, and offering them his generous support. Li has advanced our understanding of the immigrant experience in Canada. Over a 40-year career as a professor of sociology at the University of Saskatchewan, he authored a number of influential books and journal articles on race, ethnicity and social inequality. Notably, his landmark study of the experience of Chinese Canadian immigrants helped set the knowledge base for Chinese head tax redress. He has also advanced policies to help immigrants adapt to their new home as an advisor to governments and as a co-founder of the Prairie Metropolis Centre. Linden is a reformer and institution builder whose career has encompassed every aspect of justice administration in the province. Driven by a commitment to public service and to enacting change, he served as chief justice of the Ontario Court of Justice, Ontario's first Information and privacy commissioner, chair of Legal Aid Ontario, and commissioner for the Ipperwash Inquiry. He is currently Ontario's first conflict of interest commissioner. Magee is a model of corporate citizenship. As co-founder and chair of Sleep Country Canada, she built a business from the ground up to become Canada's largest mattress retailer. Through her company, she supports a wide range of charitable initiatives, notably by gifting beds to tens of thousands of children and families in need. She has also contributed her expertise and oversight to some of Canada's largest corporations as a director, and has served as a mentor to the Top 20 Under 20, the Richard Ivey School of Business, and the Women's Executive Network. McKellar is a powerful creative force in Canada's entertainment industry. After co-founding an alternative theatre company early in his career, he went on to become one of the most recognizable names in Canadian independent cinema. His work as an actor, writer and director has earned him critical acclaim, including several Genies and a Tony Award for co-creating the Broadway hit The Drowsy Chaperone. Devoted to a strong domestic film and television industry, he remains firmly rooted in Canada and serves as a supportive collaborator and mentor to other artists. Nadeau is known for her leadership on major issues related to energy production. A trained lawyer, she was a key player at Hydro-Québec for over 20 years, notably as secretary general. Renowned for her knowledge of the law, understanding of politics and superb judgment, she served as chair of the Canadian Electricity Association and became the first woman to be elected chair of the World Energy Council. Moreover, she supports a great many organizations involved in the arts, environmental protection and education. Nielsen is a pioneer of veterinary education in Canada. As the former dean of both the Western College of Veterinary Medicine and the Ontario Veterinary College, he shaped the field's curriculum and focus of research like no other. His early championing of the now commonly accepted "One Health" model placed our institutions at the vanguard of disease prevention by studying animal and human health together. He recently played a key role in establishing the Faculty of Veterinary Medicine at the University of Calgary. Paris is one of Canada's leading human rights commentators and activists. An award-winning journalist and author, she has never hesitated to address sensitive issues in order to explore the roots of intolerance. In Long Shadows: Truth, Lies and History, she examined the difficulty nations have in confronting shameful historical episodes, inspiring efforts at reconciliation with residential school survivors in this country and with the descendants of slaves in the United States. She has also mentored many young writers and has consistently taken leadership roles in the literary and human rights communities. An entrepreneur at heart, Poulin is also a model of community involvement. With daring and tenacity, he founded MAAX, a bathroom product, spa and kitchen cabinet manufacturing company, and has served as its director for over 30 years. From his modest beginnings transporting bathtubs on the roof of his car, he has built his company up to rank first in Canada. Moreover, having always placed a high value on helping others, he has focused his generosity on his region and helps younger entrepreneurs develop their businesses. Reisman has changed the face of bookselling in Canada. Highly regarded for her business acumen, she is the founder and chief executive officer of Indigo Books & Music Inc., and co-founder of the global e-reading company Kobo. She is also the founder and chair of the Indigo Love of Reading Foundation, which provides millions of books to high-needs public schools across the country. In addition, she is a dedicated community builder and lends her talents to numerous organizations, including Right to Play and the Mount Sinai Hospital. As a player, volunteer and administrator, Rider has had a major influence on the development of women's hockey across Canada and internationally. She has been involved in women's hockey since 1967 and was with the Ontario Women's Hockey Association (OWHA) when it formed in 1975. She lobbied for decades to open up the game of hockey to women and to provide them with equal opportunities for competition. Her efforts were rewarded with the first Women's World Hockey Tournament in 1987, and when women's hockey was introduced as an Olympic sport in 1998. Today, she is still involved in women's hockey, mainly as president and CEO of the OWHA. Ward's lifelong commitment to broadcasting has created new opportunities for cultural expression in Canada, and has informed and enlightened people around the world. He was on the team that launched CBC Radio's As It Happens and co-authored the transformative Meggs-Ward Report, which led to the creation of two commercial-free networks and improved local journalism. As director of CBC's Northern Service, he trained Aboriginal journalists and broadcasters, and established the first completely Inuktitut production centre. Now chair of Farm Radio International, he is sharing his experience to help empower small-scale farmers to improve food security in the developing world. Wien champions capacity building in First Nations communities. A professor emeritus at Dalhousie University, he is highly regarded for collaborating with Indigenous leaders and scholars to undertake the research they need in order to create evidence-based policies and practices. His research has contributed to the design of social welfare programs, community-based loans for Aboriginal businesses, and poverty reduction initiatives. He also created a specialized degree program at Dalhousie that provides a culturally relevant education for First Nations social workers employed with Mi'kmaq family services.